Namba Parks (なんばパークス Nanba Pākusu) is an office and shopping complex located in Namba-naka Nichome, Naniwa-ku, Osaka, Japan, the south of Namba Station on Nankai Railway. It consists of a high office building called Parks Tower and a 120-tenant shopping mall with rooftop garden. Namba Parks was developed by Jon Jerde of The Jerde Partnership in the footprint of the since closed Osaka Stadium. Various kinds of restaurants (Japanese, Korean, Italian, etc.) are located on the 6th floor, and shops are located on the 2nd to 5th floors. There is also an amphitheater for live shows, as well as space for small personal vegetable gardens and wagon shops. 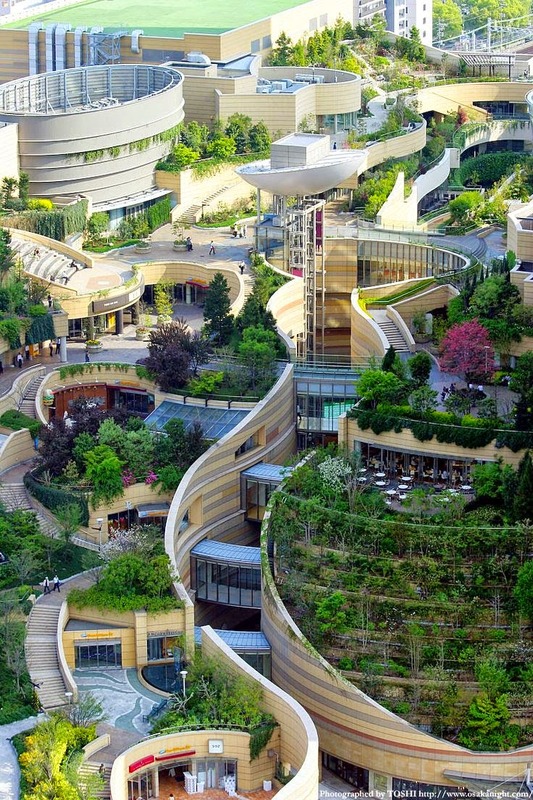 Namba Parks was conceived as a large park, a natural intervention in Osaka’s dense urban condition. Alongside a 30-story tower, the project features a lifestyle commercial center crowned with a rooftop park that crosses multiple blocks while gradually ascending eight levels. In addition to providing a highly visible green component in a city where nature is sparse, the sloping park connects to the street, making it easy for passers-by to enter its groves of trees, clusters of rocks, cliffs, lawn, streams, waterfalls, ponds and outdoor terraces. Beneath the park, a canyon carves a path through specialty retail, entertainment and dining venues.